A TOWER OF VICTORIAN STRENGTH. Baz [soon to be 70] phones – what about a walk on Sunday? Yes, good idea and good forecast. Hmm .. Abbey Village, halfway point. Will sort out a route later. We have had a lot of rain these last few days so I looked at the map for bridleways and ancient lanes, there are plenty in this area of Lancashire. Our arrival times at 9.30 were impeccable. 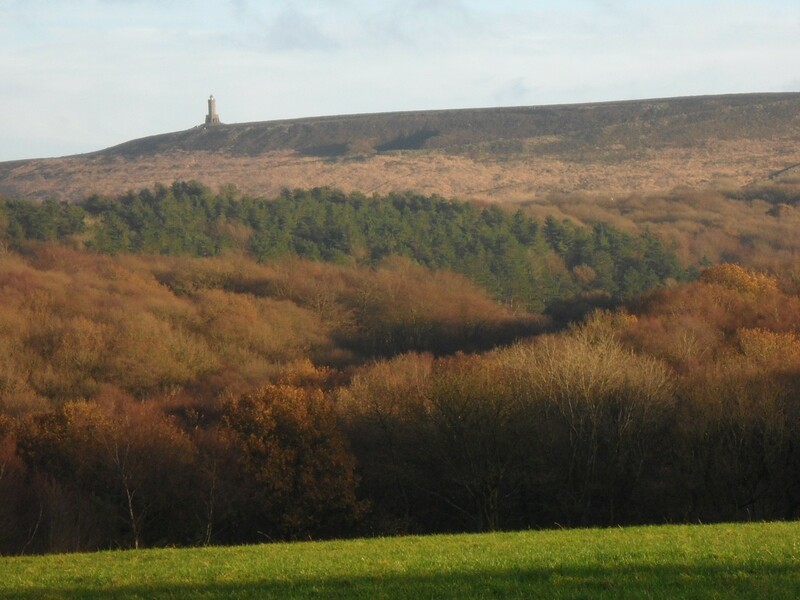 So after a short section through autumn woods we found ourselves at the friendly cafe at Ryal Fold where, over coffee, we decided on a walk over Darwen Moor visiting Darwen Tower. 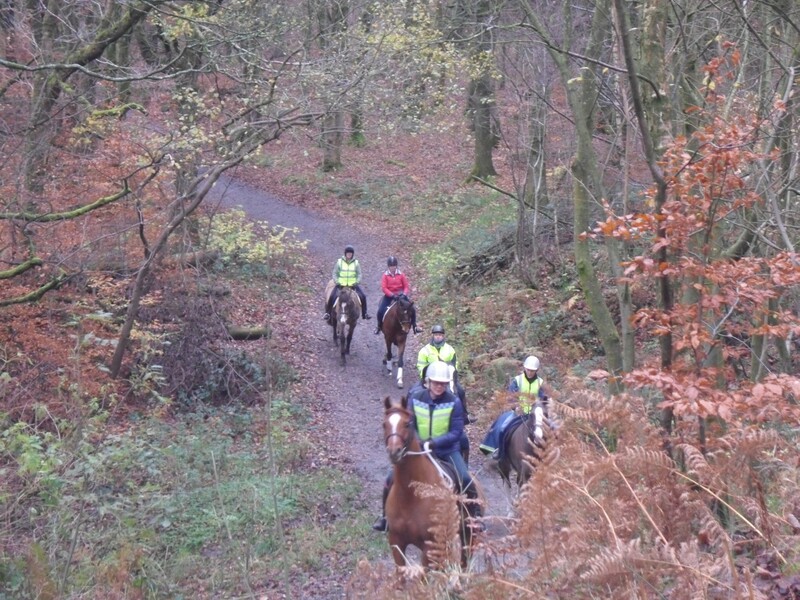 It was good to see that area was extremely busy with hikers, dog walkers, cyclists and horse riders. We have walked most of the paths in this area over the last 40 years or so but one can always find something different or forgotten. 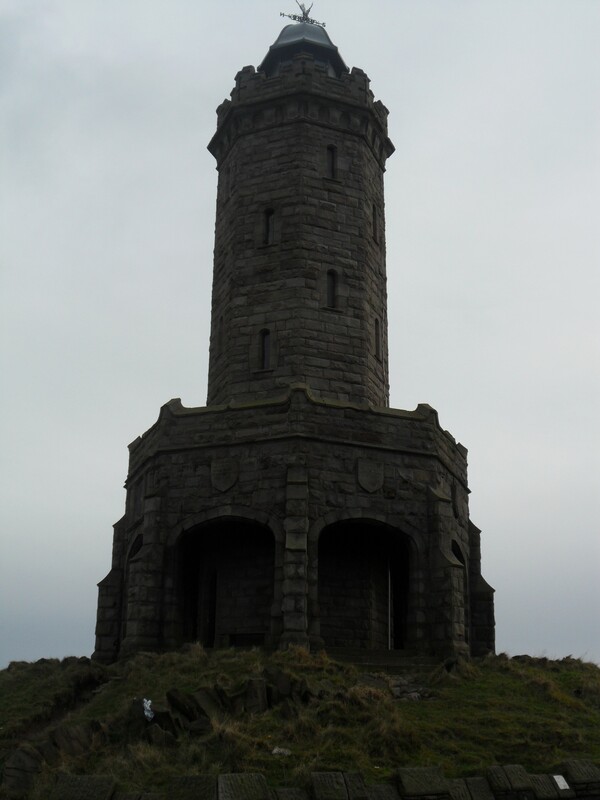 So we made our way up onto Darwin Hill and towards our objective of Darwen [Jubilee] Tower. The sky was clearing to blue. Darwen Tower [the rocket!] 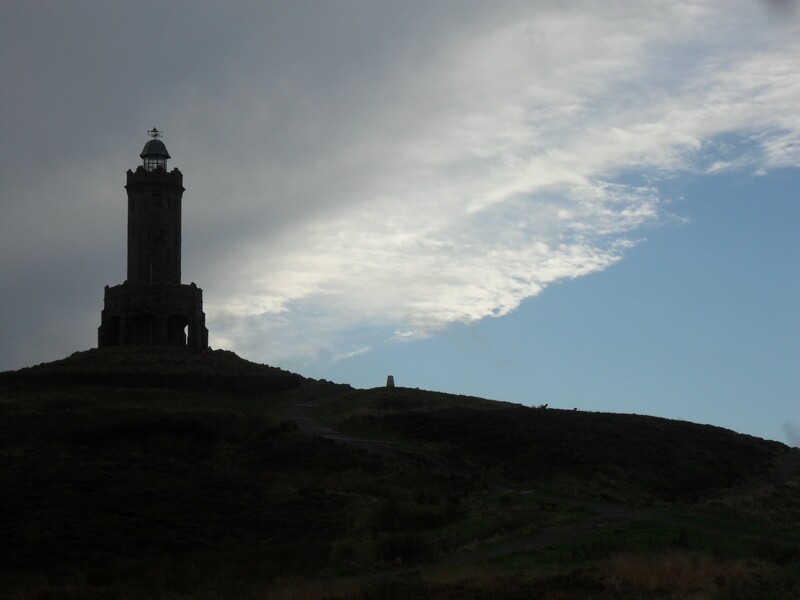 was erected in 1898 to celebrate Queen Victoria’s Diamond Jubilee and the freeing of access to these moors. 85ft in height with an internal staircase to a viewing platform it must have been impressive for the local population of the cotton town. Local subscriptions paid for a refurbishment in the 1970s. The tower dome was blown off in 2010!!! A replacement in stainless steel was winched into place in 2012. It was up here today that we looked out over Lancashire. 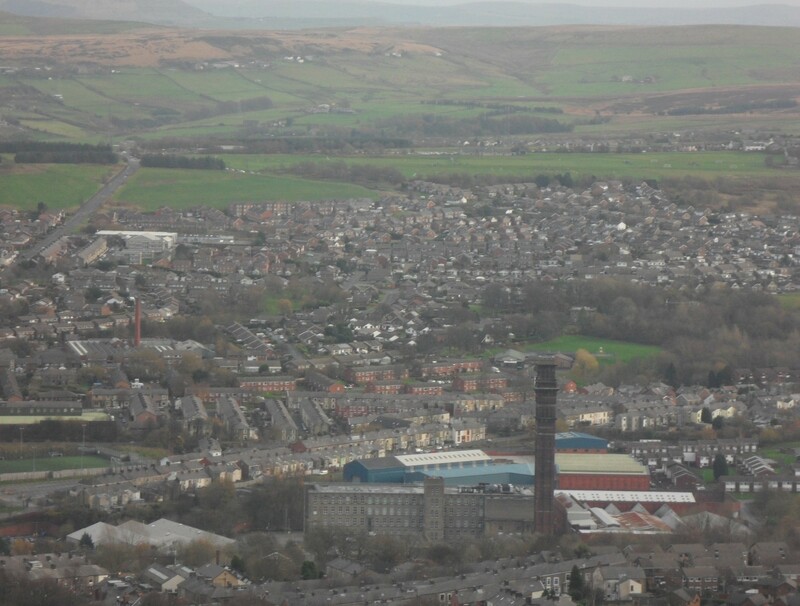 Morecambe Bay, Bowland Fells, Yorkshire Hills and a birds eye view of Darwen with the India Mill Chimney prominent. 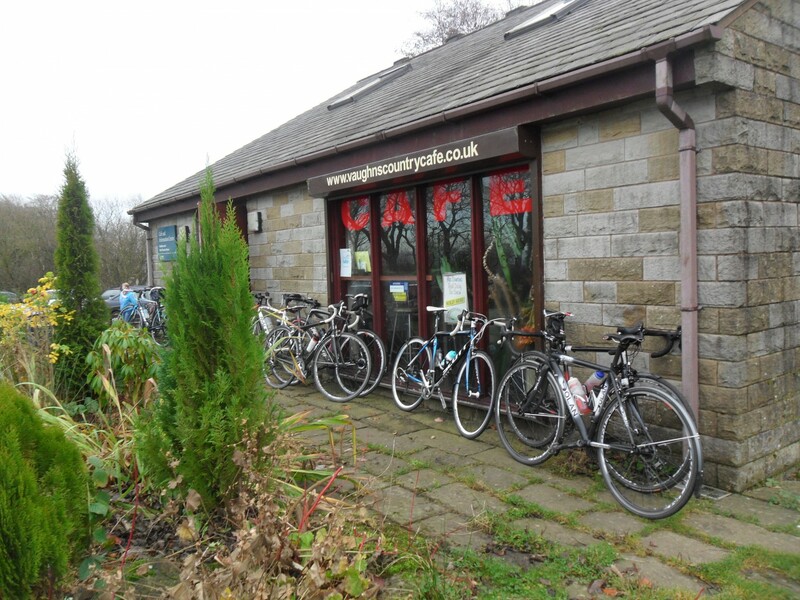 From here it was quickly downhill to Sunnyhurst Wood which reaches into the centre of Darwen and is a popular recreational area. 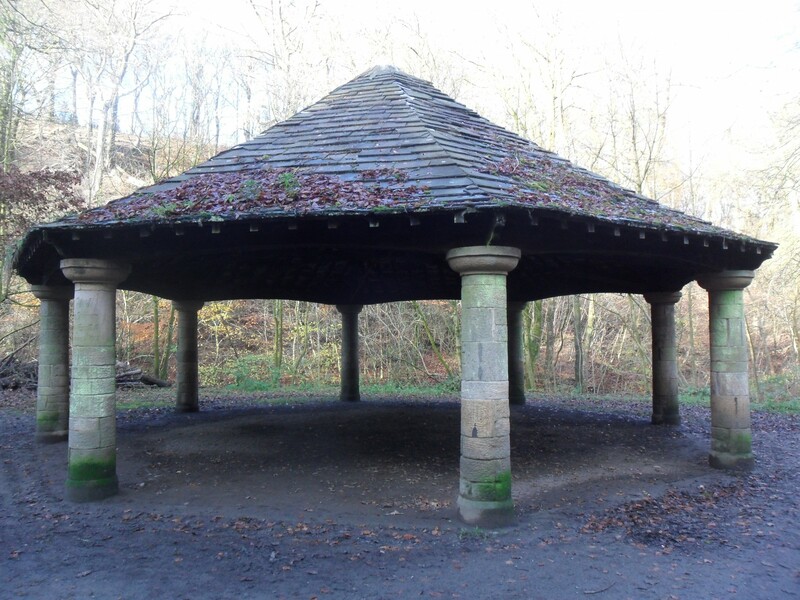 We lunched next to the old bandstand, an octagonal structure of eight stone towers and a stone flagged roof. This is an Edwardian structure presented by a Mr. Charles Spencer Greenway in 1912. The tradition of private donation continues to this day as the metal bench, one of several, we were sitting on was a recent donation. Out of the woods we passed through historic Tockholes and across vague field paths to emerge at Abbey Village conveniently close to the friendly Hare and Hounds! Only a short day but in lovely weather and visiting old haunts by some new paths, all of which helps to maintain ones enthusiasm for all things local. This entry was posted in Lancashire., Walking. and tagged Lancashire, Walking. on November 25, 2014 by bowlandclimber.